The MC30 from Bulldog is a ground anchor, chain and padlock which is perfect for keeping your motorbikes, quad bikes and scooters – even lawn mowers secure at home. We’ve all seen more and more CCTV videos of attempted break-ins doing the rounds on social media, and the crime statistics back it up that crime is on the up as thieves are getting more brazen and more desperate as well as more advanced in their methods to beat the bolts. Trailers are often seen as an easy target but Bulldog have several ways in which you can make sure they’re secure. Starting with a hitch lock, there are locks that can be used either hitched or un-hitched so stationary or on the move and the locks need to be correct for your specific hitch heads; Knott, Alko, Bradley, Brenderup, Albe or Avonride. Then there are also a range of wheel clamps including the award winning QD range that will fit all sizes of trailer wheels. You can also get the BD1 tracker which will alert you should any try to move your trailer and the fourth option is a security post or hitch post which is locked to the ground either in front of the trailer or the trailer is hitched to which will prevent unauthorised movement. This same group of products; hitch locks, wheel clamps, security posts and trackers are tried and tested and also perfect for caravans. For cars and vans Bulldog also does a steering wheel lock in addition to their vast range of wheel clamps. 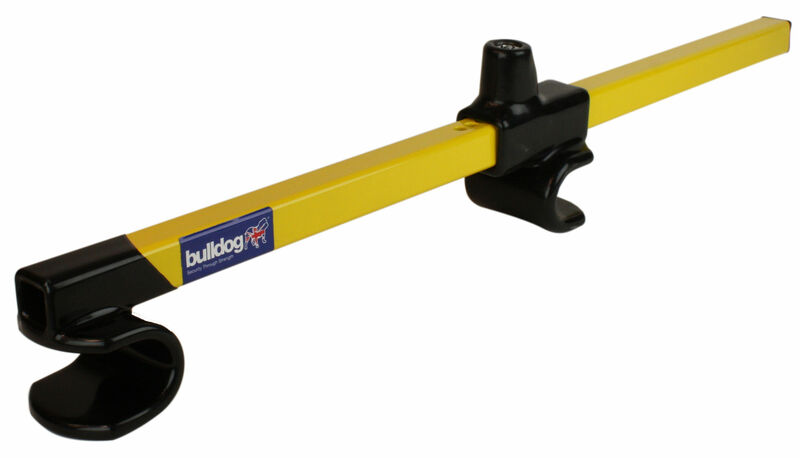 The Bulldog wheel clamp range comprises; Titan, Centaur, Euro Clamp, Auto Clamp and QD lock. The Euro Clamp is the smallest wheel clamp perfect for taking on the move with you. Voted What Car Magazines ‘best buy’ there are 2 different sizes available which suit motorcycles, cars, caravans, trailers or the larger EM4x4SS which suits motor homes, vans and 4X4s. The award winning QD range are the perfect clamps for caravans and trailers, even being awarded Practical Caravan magazines best buy accolade. Finally there is the adjustable Auto Clamp which comes in three sizes which cater for most tyre sizes, it is simple to fit, a lighter weight clamp it’s also easier to handle and use on the move. Posted in Product profiles on 30th January 2018 . Don’t take chances with your vehicle; we forbid it. 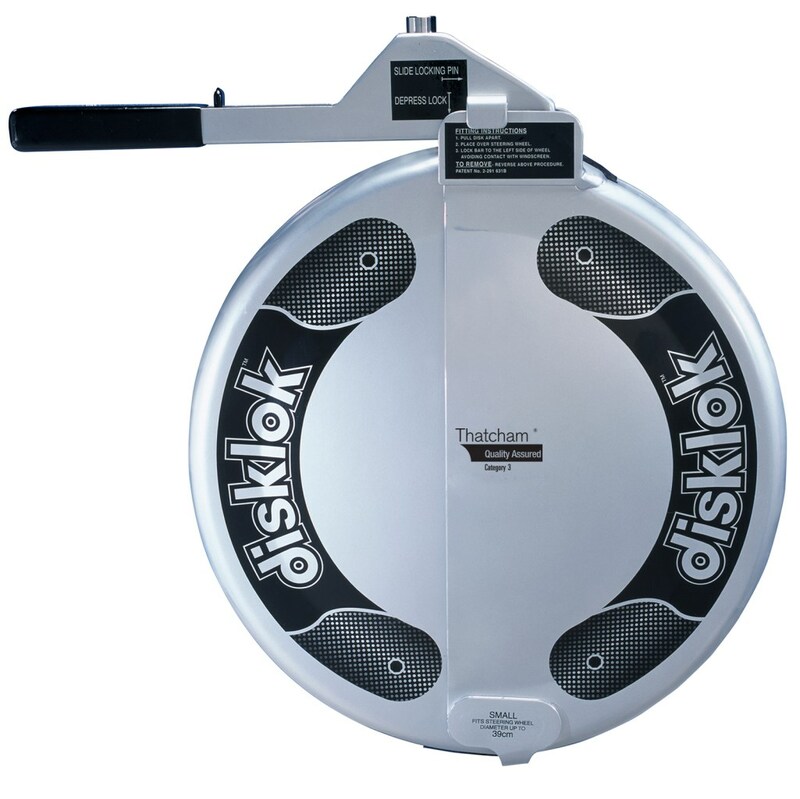 Order your Disklok TODAY. When it comes to keeping the big stuff like your home, car and wallet safe, you want to take advantage of every protection system available. As well as deterring potential thieves from even bothering with an attempt to steal your stuff, good security measures prevent the more determined criminals and, in the worst case scenario, at least you can truthfully tell your insurance company that you did all you could to protect your valuables. While we here at MotorNuts clearly accept the importance of the home and the necessity of the wallet, these things are but minor concerns compared to what REALLY matters: our beloved motor vehicles! Yes, my home is my castle and money is my freedom but my car is BOTH of those things at the same time; try sleeping in your wallet or driving to work in your house if you don’t believe me! All this joking around does have its serious side, namely the fact that around 370,000 cars a year are stolen in the UK (over 1,000 per DAY!) and this 2015 figure, unbelievably, represented an all-time LOW for that particular unpleasant statistic. We don’t know how many of these vehicles were not adequately protected, but we are guessing from the intelligence level of the average car thief that it can’t have been very many. Once you allow for the master criminals who have managed to get around every protection device, we reckon that about 369,999 of those cars didn’t have proper safety features! This is where the widely-recognised, widely-trusted and widely-despised (by the car thieves!) Disklok comes in. 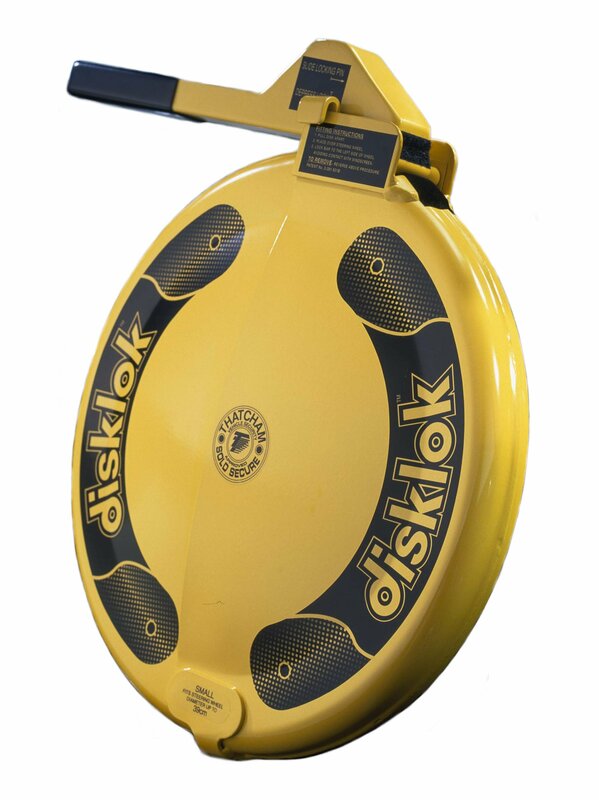 If you have a car then you need a Disklok and we really can’t say it any more simply than that. Check out these few brief details and see if we don't convince you. Your car is still on the drive right now. Isn’t it? For the aesthetically-conscious, there is a choice of two colours. Silver gives that classic subtle look while the Yellow model leaves nobody in any doubt as to its presence! Make sure you're not in for a shock! Get your Disklok... if you need any additional advice or information contact our expert team. Posted in Product profiles on 4th January 2018 . The RoadHero space saver spare wheel kit is everything you need to get home safely in the event of a flat tyre, puncture or blowout. The kit, all stored in a handy bag, contains a steel wheel with inflated tyre as well as a jack and brace for fitting. RoadHero solves a genuine problem with as many as two thirds of new cars not coming with spare wheels or space savers but repair kits instead. Drivers are increasingly frustrated with repair kits and tyre sealants which work for a basic puncture they prefer the peace of mind of having a traditional spare. RoadHero has come to market through Wheelwright who is one of the UKs leading wheel distributors with over 35 years experience in the alloy and steel wheel industries. From their warehouse in Kent, Wheelwright supplies the UK and Europe with the largest choice of wheel styles available from one supplier. Their knowledge and experience of wheels for all the different makes and models of cars is second to none and so when they’ve developed the RoadHero it’s safe to say they know their stuff for all vehicles. Posted in Product profiles on 12th October 2017 . Millers range of classic oils, treatments and additives combines the latest advances in lubrication technology with the specific requirements of classic and vintage vehicles providing the ultimate protection and performance. Millers Oils have been manufactured by the Miller family from their site in Yorkshire for the last 130 years. Founder John W. Miller promised his early customers ‘The quality of my oil will be rigidly adhered to.’ and this has become an ethos of the still family run business who are committed to quality and innovation. This ethos has earned Millers a reputation for being a specialist in quality oils for specialist vehicles – and this is why we love their Classic range. The Millers Classic range not only meets the needs, but exceeds the specific requirements of older vehicles allowing them to achieve optimum performance whilst crucially for vehicles of this age delivering optimum protection. The Pistoneze is a quality 20w50 multigrade engine oil suitable for any classic car or vintage cars with a modern filtration system. The Classic Sport is as it says on the tin – not just for any classic car but for classic sports cars. The semi synthetic 20w 50 offers enhanced additives and shear stable viscosity index improvers all adding up to increased performance. The Classic Sport High Performance 20w50 engine oil incorporates multi award winning Nanodrive™ - an ultra low friction technology designed for motorsport which delivers a discernible increase in performance...­perfect for Nuts racing classic and vintage cars! The range also has an oil specifically formulated for the requirement of old minis, as well as an 80w90 extreme pressure mineral based gear oil with performance additives. Finally we are delighted with Millers range of treatments and additives designed to provide ethanol protection and lead replacement so vital to classic cars. Posted in Product profiles on 26th September 2017 . At MotorNuts we specialise in vehicle security, including wheel clamps, steering locks, hitch locks and security posts. One of our trusted partners Bulldog have taken their 30 years experience in security manufacturing and design to a new level and launched a new range of trackers. Their easy to use trackers provide real time tracking to monitor the precise location of your vehicles, assets and even family! All trackers are super easy to use, just plug in switch on and away you go – and if you do encounter any queries you can access Bulldogs free UK based support services. The full range of trackers all come pre-installed with GPS and SIM card and work easily with afreesmart phone app. Your vehicle can be tracked across UK and Europe as they use all mobile networks. With caravans costing as much as £25,000 and motor homes up to £100,000 installing one of the TR25s is a no brainer, cost effective and easy to use they offer that extra level peace of mind. Be alerted if your caravan or motor home is moved - the TR25 not only lets you track your caravan or motor home but will pro-actively alert you if it moves from where you left it. Trailer theft is big business; make sure you’ve got all options covered with the TR35 tracker - no installation required. With 4 years battery life, this tracker simply attaches to your trailer with a super strong magnet. Use a PC, smart phone app or even text or phone your tracker if required to get its exact location. The TR68 is easily plugged straight into your vehicles OBD (On Board Diagnostics) socket to provide power. As well as security and tracking the TR68 can tell you much more – especially handing if using with fleets; driving style, speed, rest breaks, remote driver identification and vehicle immobilisation and alarms for movement outside a pre-defined boundary. 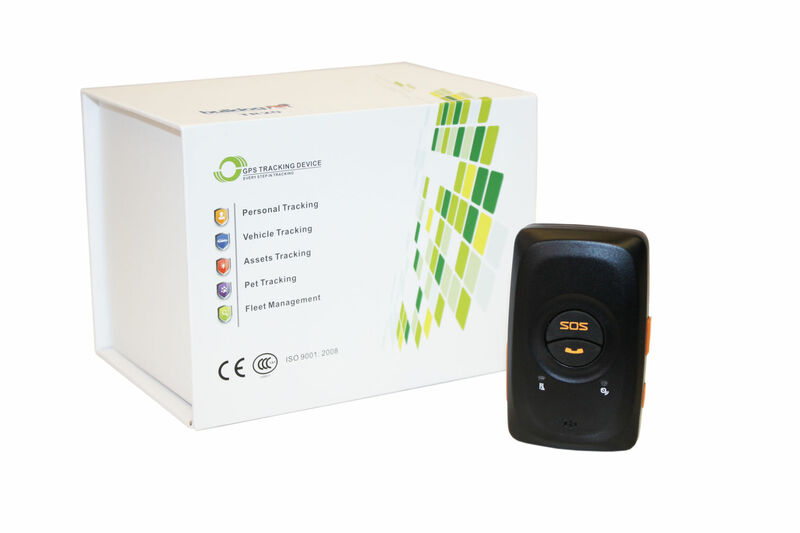 The TR20 boasts the most features of all the trackers. As well as the usual alerts it has in built phone with SOS function and listen in feature, perfect for lone workers or the elderly it offers full "Man Down" functionality alerting pre-programmed numbers in the event of a fall or movement outside pre defined geo-fences. Posted in Product profiles on 14th September 2017 . An absolute classic workshop must have the Haynes manual – they have everything covered for service and repair from simple roadside repairs, through maintenance and MOT test checks to full restorations. The Haynes manuals cover exact makes, models and years; simply select the right one and you’re away. Each manual follows the same straight forward format; starting out with basic usability and safety and roadside repairs. Then you’re onto weekly maintenance checks including what to look for under the bonnet, checking engine oil and coolant levels, batteries and electrical systems and lubricants and fluids to name a few. For the keener mechanic the manuals then take you through more major repairs and overhauls including engine systems, transmissions, brakes and suspension and body equipment. The straight forward step by step guides for each process means that either a novice or an experienced car fettler can follow the steps and get the job done. The Haynes manuals started out when John Haynes OBE wrote his first book on building an Austin 7 Special in 1956. He then went onto to develop his first proper manual in the style we see today for an Austin Healey ‘Frogeye’ Sprite the format, including strip down and rebuild of the project using of step-by-step hasn’t changed to this day and the brand is now a globally recognised publisher of practical information. Whilst the books themselves are a firm favourite Haynes are keeping up with technology and introducing downloadable versions of the manuals for certain makes and models, something MotorNuts are trialling and will be bringing you soon. Posted in Product profiles on 31st July 2017 . How often do you really think about the day to day wear and tear your car gets – mainly the engine. MotorNuts are Nuts about treatments and our customers seem to agree and love the results. 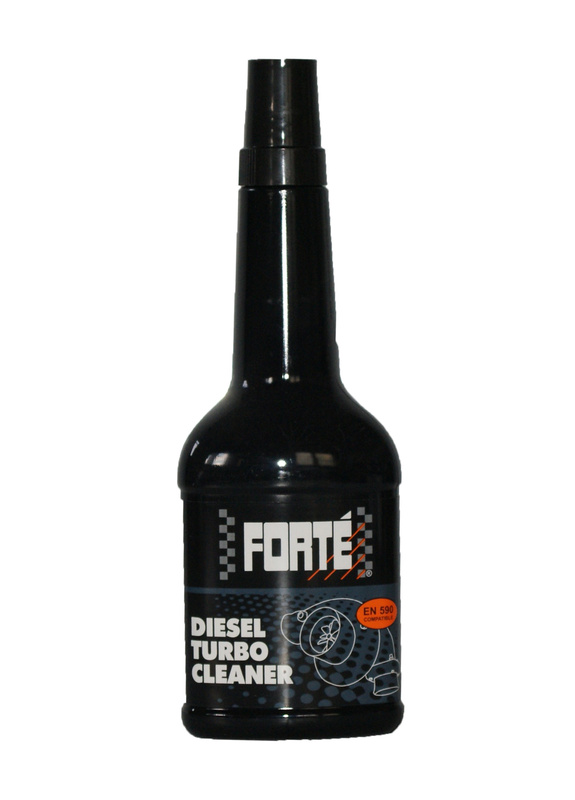 Firstly for Diesel engines we love the Forte triple pack which combines 1 DPF cleaner and regenerator, 1 turbo cleaner and 1 advanced formula treatment. 1) The best one to start with is the Diesel Particulate Filter Cleaner and Regenerator which has been specifically formulated to tackle the effects that start/stop driving has on DPF regeneration. If you own a diesel you will have almost certainly seen the DPF light come on and have heard about the problems it can lead to. 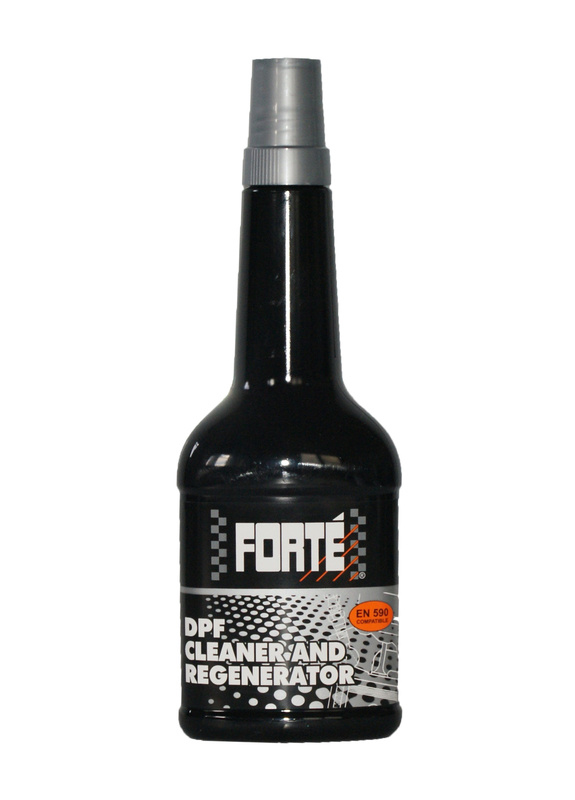 The Forté DPF Cleaner and Regenerator uses a catalyst to clean the soot during combustion crucially reducing the temperature that it can be burnt off which helps regenerate the filter, improving its performance and in turn reducing soot emissions. In a nutshell build up accumulates in the turbo reducing vehicle power and efficiency which will ultimately show up as an engine management fault. Like all Forte treatments they recommend using at regular service intervals or as a first call response to a warning light. Forté Advanced Formula Diesel Treatment is designed specially to combat driveability concerns that come as a result of a build up of the by-products of combustion and fuel deterioration. 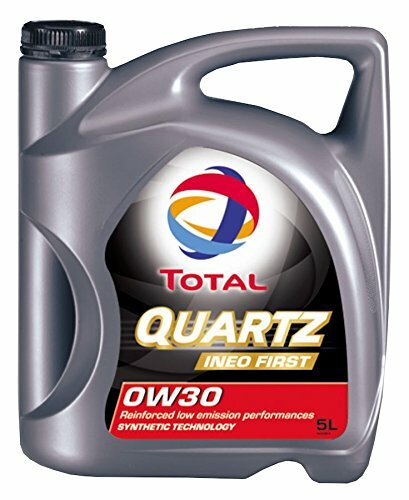 This treatment is for the whole of the fuel system and cleans and lubricates throughout improving overall engine power and efficiency and considerably reducing potential down time and costly component replacement. We are Nuts about looking after your petrol engine cars as well and have an excellent product from Wynns which will do the job. Wynn's Xtreme Petrol System Clean is a powerful cleaning treatment, designed to restore, protect and maintain performance of modern petrol engines. The ‘one tank’ treatment cleans and protects not only injectors but the entire fuel system restoring any loss in engine performance. A well as cleaning and improving performance Wynns Extreme Petrol System Clean also improves fuel economy and reduces emissions. Posted in Product profiles, Advice on 26th June 2017 . Granville has recently launched a new generation, fully synthetic multi-grade engine oil formulated to meet the performance demands of low emission engines. This new oil combines high performance, fuel efficiency and emission control and MotorNuts are proud to bring them to market. We have a long established relationship with Granville Oils who blend all their own oils on site at their Yorkshire site, producing up to 100,000 litres every day. Granville are more than just oils though, they also distribute leading car brands Gunk and Turtle Wax to name a few. This latest range of fully synthetic engine oils in their eye catching gold bottle were developed in response to the EU emissions legislation announced in 2011 and are formulated to work with the subsequently introduced exhaust treatment devices – more commonly known as DPF filters. The comprehensive range will suit 95% of vehicles and they are specially designed to protect exhaust emission treatment devices where using the wrong engine oil could cause contamination or damage which would result in costly repairs. These low SAPS (sulphated ash, phosphorus and sulphur) engine oils are ultra modern and designed to meet the needs of the latest vehicles. 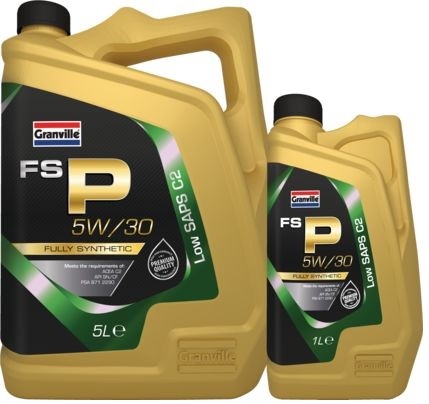 The Granville range has Low SAPS oils for most marks and models including most commonly; BMW LL-04, VW 505.00, PSA-B712290, VW 507.00 and GM LL-A-025 to name a few. Specifications cover viscosities from 0w/30 through 5w/20, 5w/30 and 5w/40. As ever it is important make sure you use the correct oil for your vehicle. This can be found in your handbook or alternatively enter your reg in our vehicle look up to find what is recommended. Posted in Product profiles on 10th April 2017 . Whilst car crime figures are decreasing on a whole vehicle theft is still all too common a crime. MotorNuts are all about making sure you have your vehicles, caravans and trailers on lock down with a wide range of vehicle security products - and a few of our top tips. Make sure your vehicle is locked and where you have one alarm and immobiliser is switched on. It may sound obvious but it’s surprisingly easy to leave it unlocked when its outside your house or whilst you nip into the shop or to pay for petrol – it’s even easier to walk away clicking the key fob and not check if it’s actually worked. The bold, bright Disklok is a tried and tested deterrent. It’s unique design allows the steering wheel lock to rotate with the wheel itself if it is being tampered which helps prevent damage to the steering wheel and column. Its high visibility (it comes in bright yellow or silver) and its reputation for durability (it takes longer for security experts to break than the competition) certainly helps discourage break-ins. 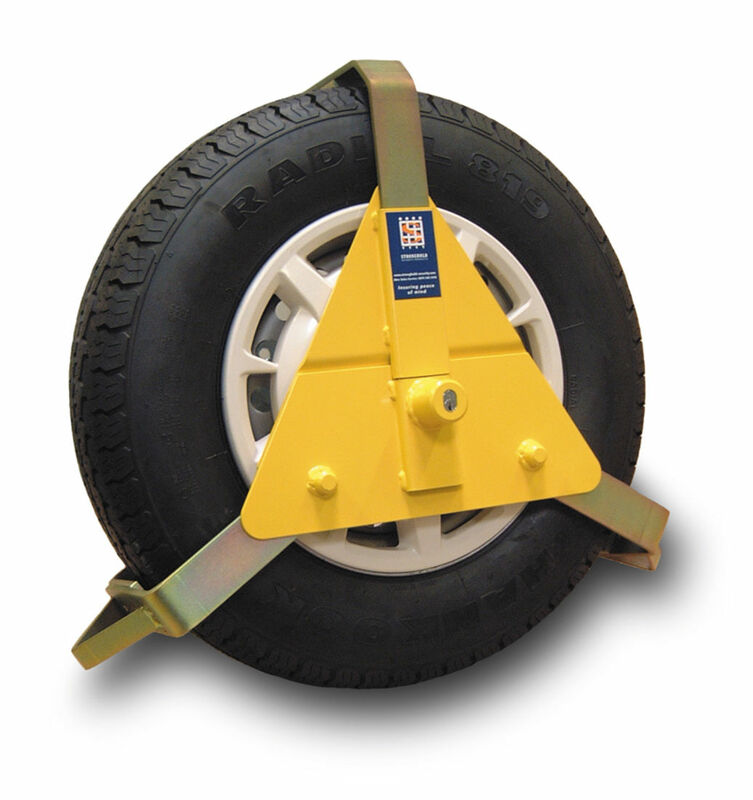 High security, steel encased wheel clamps are another extremely visible, tamper proof deterrent on your car, trailer or caravan. There is a product in the range for all sizes and styles of wheel that not only meet but exceed security standards and are insurance approved. For added peace of mind vehicle trackers can be checked remotely at any time to make sure your vehicle or caravan is exactly where you left it. Should the worst happen they can also prove instrumental in recovering the vehicle and will omit emergency SOS alerts. If you are using any of these security products we suggest from leading brands Maypole, Disklok StrongHold and Bulldog make sure you are getting the maximum discount from your car insurance providers. Posted in Product profiles, Advice on 27th February 2017 . We all love a bargain. And here at Motornuts, we even love our own bargains because they're that good. They change all the time so you can always save on something you need and there is a fresh crop of goodies just waiting to be discovered. Let's find out what you could be saving on very soon! Being seen on the roads is always a matter of vital importance and becomes even more so during the winter months, when the sun goes doewn early and roads can be slippery. We all gave a cheer when the clocks went back but now the reality is setting in that we will have a LOT of early dark nights for the next few months and one of the first places we really notice it is on the roads. Give your vehicle a bright, light and white glow (perfect for Christmas!) 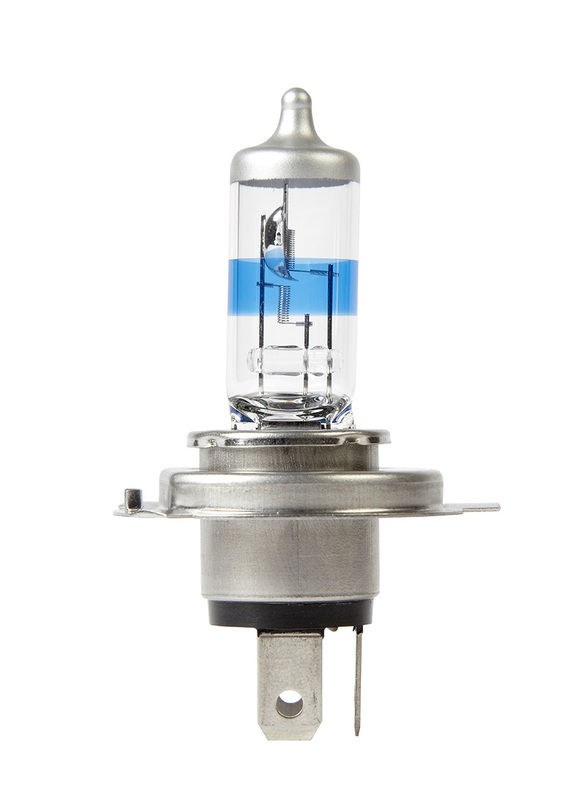 with our Ring Xenon Headlight Bulbs which, once installed, give up to 130% more light on the road surface to give you the edge when it comes to seasonal safety this year and next. The intense light from these long-lasting xenon bulbs closely resembles daylight and so you can defeat the winter darkness! For a limited time, you can save 10% so that the twinkle in your eye is almost as bright as the bulbs themselves. Almost. The feelings of irritation, anger, rage and finally weeping defeat that we feel when our car won't start on a cold, dark and miserable morning cannot be adequately described in this news article, as the words necessary are beyond unprintable. You'll be glad to know, then, that Total Quatz Ineo is particularly impressive at facilitating first-time ignition in extremely cold weather, this in addition to its countless other qualities. The formula has been rigorously tested right down to -40 degrees Centigrade so if you are heading into the Arctic Circle then you may want something a little stronger. From Devon to Dunkirk, however, you'll be just fine. Oh yeah, and you can save 15% if you buy from us now! There is more to discover in our dedicated 'Special Offers'. Posted in Product profiles on 7th November 2016 .